It rained for 40 days and 40 nights, but it took another 110 days before the waters receded and the Ark finally came to rest upon the mountains of Ararat. In “The Celebration”, this historic occasion is recalled in tremendous detail and splendor. In the center stands Noah. He is surrounded by the animals and family members who traveled with him aboard the Ark, saving mankind and the animals of the earth from extinction. True to the Bible’s version, there is two of everything, including flamingos, lions, zebras and elephants in this tapestry. 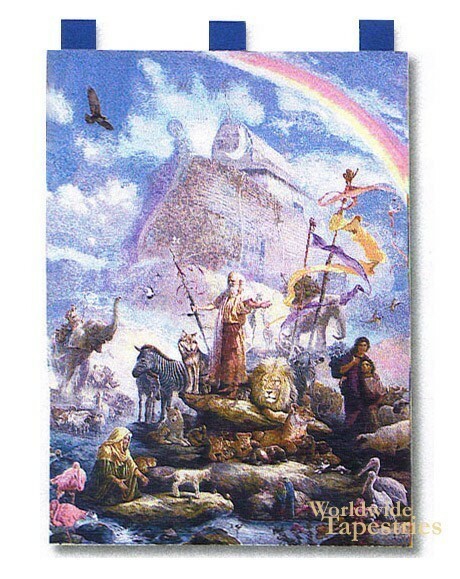 Behind Noah is the Ark itself, resting on the mountaintop. A rainbow streams across the sky, keeping God’s promise: “Whenever I bring clouds over the earth and the rainbow appears in the clouds, I will see it and remember the everlasting covenant between God and all the living creatures of every kind on the earth”. This wonderful tapestry is lined on the back and has a tunnel for easy hanging.